Ternary cobalt-based metal oxide (ZnCo2O4) has been successfully coated onto aluminum substrate via sol–gel method. The coatings were characterized by X-ray diffraction (XRD), field emission scanning electron microscopy (FESEM), energy dispersive X-ray (EDX) and UV–Vis–NIR spectrophotometry. Thermal degradation of the coatings was probed by thermogravimetric analysis (TGA) and differential thermal analysis (DTA). Model of crystal growth kinetics and density functional theory (DFT) calculations further probed the crystalline structure evolution. The predicted ZnCo2O4 crystalline structures were confirmed by XRD and EDX. The grain growth kinetic model for ZnCo2O4, derived from Lifshitz–Slyozov–Wagner (LSW) theory, determined that the growth of crystalline phases is unaffected by the annealing temperature; however, the crystallites’ sizes decreased with the increase in precursor concentration. DFT analysis indicated that structural energy stability between the bulk state and slabs of ZnCo2O4 was at two oxygen layers (O-layers) with an optimum grain width of 17.21 Å. Interestingly, the morphology of ZnCo2O4 represented a rose-like template structure formed by inter-connecting layers of nanosheets. This unique surface morphology enhanced the optical absorptance properties up to α = 70.7%. The kinetics, structural and absorptance properties of zinc and cobalt mixed oxides are not well understood due to lack of prior consolidated research findings. Therefore, our research focuses on the formation, grain growth kinetics, mineralogical and surface structure, as well as the absorptance properties of zinc and cobalt mixed oxides coating on aluminum substrates. 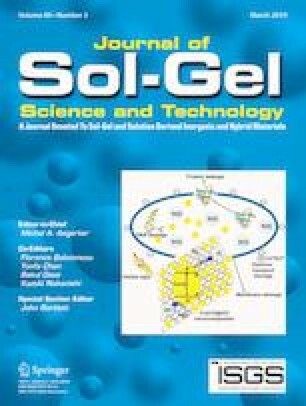 This represents a novel holistic analysis within the ambit of sol-gel science. Furthermore, the novelty involves the incorporation of the experimental results complemented by grain growth kinetics modelling using LSW model and simulation of the grain size against the coating thickness of ZnCo2O4. We also developed a model at a smaller scale and utilized the density functional theory (DFT) to calculate the stability of each case in the model. Sol–gel Absorptance Crystal growth Nanorose Crystalline structural Zinc cobalt oxide. This research work was financially supported by IRU-MRUN Collaborative Research Program (2015–2018). This research work was financially supported by Collaborative Research Program between Murdoch University and Universitas Riau (IRU-MRUN) in 2015-2018. The authors thank to University Sains Malaysia especially to Dr. Chuah Lee Siang for provide the characterization equipment and appreciation to Prof. Amun Amri and Dr. Zhong-Tao Jiang for his encouragement in this work.